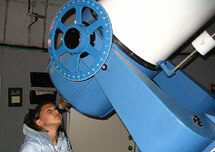 A young observer peers through the CAA's vintage Celestron 16 telescope. The CAA hosts at least 12 Saturday Public Observing events featuring a guest speaker that is followed—weather permitting—by celestial viewings through telescopes at the facility. During viewing hours, society members will be available to answer questions and provide everyone with an opportunity to look through the Society's telescopes and those of our members. This site will be updated through out the year as we assemble our speakers and events. Cosmic Mayhem: Supernovae, Active Galactic Nuclei, and Other High-Energy Events That Have Shaped Earth's HIstory. Does the Earth really orbit the Sun? The Importance of Perspective. A famous debate between Galileo and the authorities of the day seemed, on the surface, to be about whether the Earth orbits the Sun or the Sun orbits the Earth. Since then, we have discovered that the stakes of that debate were actually quite different, and quite a bit more important, but the issue of what orbits what does not exhibit the character of a physical truth. Understanding what is a physical truth, and how our perspective relates to our understanding, is a valuable tool in modern astronomy, and has deeper philosophical implications that we will explore. The Cedar Amateur Astronomers, Inc. is a participating member of Night Sky Network.